My last response to Wijewardena and his aids made important revelation about his involvement in notorious private placement causing massive loses to the Government and the economy at large. On 17 January, by a column in this paper, I revealed his involvement for the first time. I am humbled by Wijewardena’s salutation on my professional approach in answering his single-sided critiques over the past few years. As he had explained using the sublime teachings of Lord Buddha, I patiently stayed his baseless criticism and finally decided to answer him professionally supported by stubborn facts. Wijewardena attempts to escape important question by hanging on to disclosure of retirement package. He simply forgets that he strongly objected to a small salary increase given to the public sector while enjoying a lavish (many times bigger) retirement package at the expense of the public. He advocates against any small relief given to the common man. I questioned only his double standards. If he wishes to dodge this simple argument further, so be it. I raised doubts that Wijewardena could use his colleagues in the Central Bank to cover his past misdeeds as the Deputy Governor in the infamous private placements. If he is true to his words, he should be with me in calling the Central Bank to remain hands off in selecting a forensic audit firm. If his colleagues in the Central Bank are involved in the selection process, the truth will be suppressed. 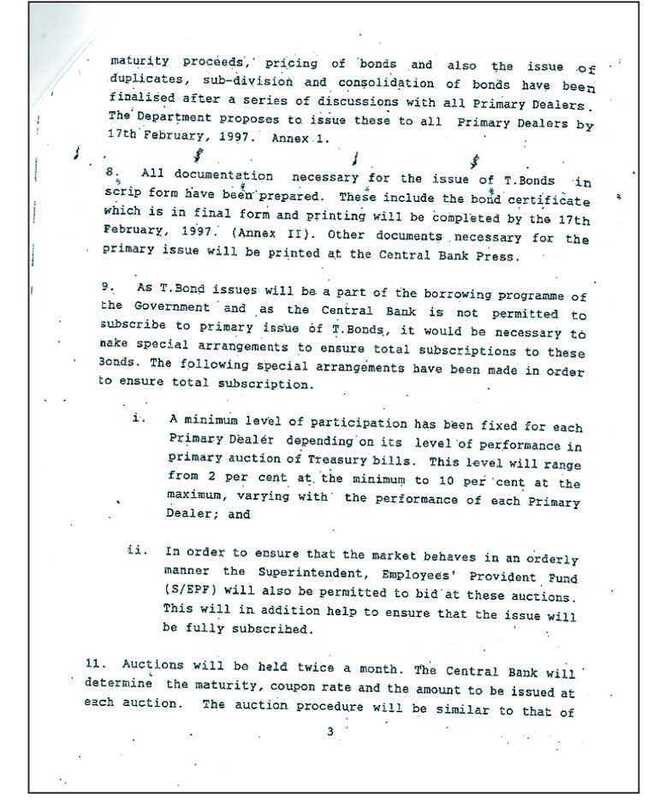 Wijewardena continues to mislead readers referring to a Board paper dated 14 February 1997. Please refer the relevant section of the paper. The Monetary Board permitted the EPF to bid at the T-bond auction directly without going through a primary dealer. It closed the door for PDs earning any fees from the EPF for bidding the auction. Contrary to the claim by Wijewardena, no permission was given for any sort of private placements to the EPF. He disputed the loss table produced in my last article, saying that additional information should be considered. He being the Deputy Governor in charge of public debt should have considered those factors prior to approval of private placements during that period. Obviously, if he refutes my claim, he can produce that information and prove that I am wrong. It appears that he has blindly approved those private placements without looking into any of that information. The conclusion of the Auditor General can be challenged if it contradicts the findings. But the facts cannot be challenged. The opinion of the Auditor General may be influenced by the people who advised him on a technical subject in which he has limited knowledge as he also admitted. Wijewardena has publicly acknowledged that he advised the Auditor General and COPE on several occasions on technical subjects. Readers can guess who misled the Auditor General for making a conclusion in contrast to the facts contained in the report. He refers to the report of the Auditor General that a majority of bonds have been issued below the yield curve, they have been raised on the principle of borrowing at the minimum cost to the Government, thereby generating a premium income to the Government. But the fact is that majority (66%) of the T-bonds issued through private placements are at yield rates above the prevailing market rates, according to the same report by the Auditor General. His first response says late A.S. Jayawardena has given approval for private placements. He and his friends later changed their stance to refer a gazette notification in 2002 by late K.N. Choksy. Without passing the responsibility to deceased people who cannot answer on the subject, he should produce the evidence to prove his references. No one has ever produced any such evidence, even to the Bond Commission, since there are no such documents as erroneously claimed by them. If the PDD is solely responsible for the content of the Board papers as Wijewardena stated, what is the duty of a Deputy Governor? Is the Deputy Governor only a mere post-box? No, the Bond Commission report clearly states that the Deputy Governor being the most senior officer of the bank is responsible for any wrongdoing within the bank. 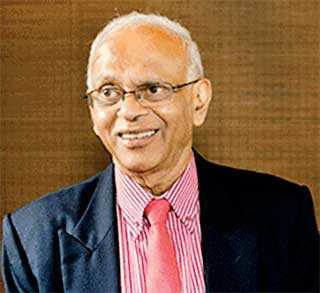 The Bond Commission accused Dr. Nandalal Weerasinghe, the present Senior Deputy Governor, of negligence and breach of responsibilities as a Deputy Governor of the CBSL (please refer pages 890,896 927 and 930 of the report). Wijewardena cannot wash his hands by passing the responsibility to the PDD. According to him, the decisions taken in the Central Bank are all Monetary Board decisions since the Board has powers to accept, modify or reject a recommendation. True, if the Monetary Board has time to evaluate. The said Board paper was not circulated to members of the Monetary Board in advance and it was tabled in hurry. Generally, a Board paper is tabled when an immediate action is required to respond a crisis situation. 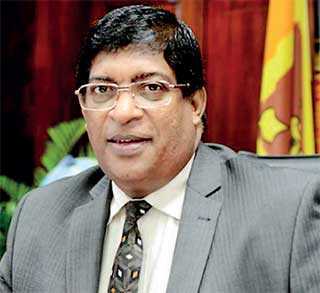 He didn’t explain the reason for rushing such a decision without giving time for the appropriate decision-making process to follow when there is no such a crisis Wijewardena should stop beating about the bush and answer the key question. His mumbling response has proved my expose about his past misdeeds. Continuing with my arguments, I should expose another blatant lie propagated by Wijewardena who claims to be an expert on Treasury bonds. Responding to a question raised by someone on Facebook on what the practice is in other South Asian countries in bond issues – direct placements or auction system, he says direct placement is the standard practice throughout the globe as reported by World Bank in its manual on ‘Developing Government Bond Markets’. This is a deliberate lie. a. 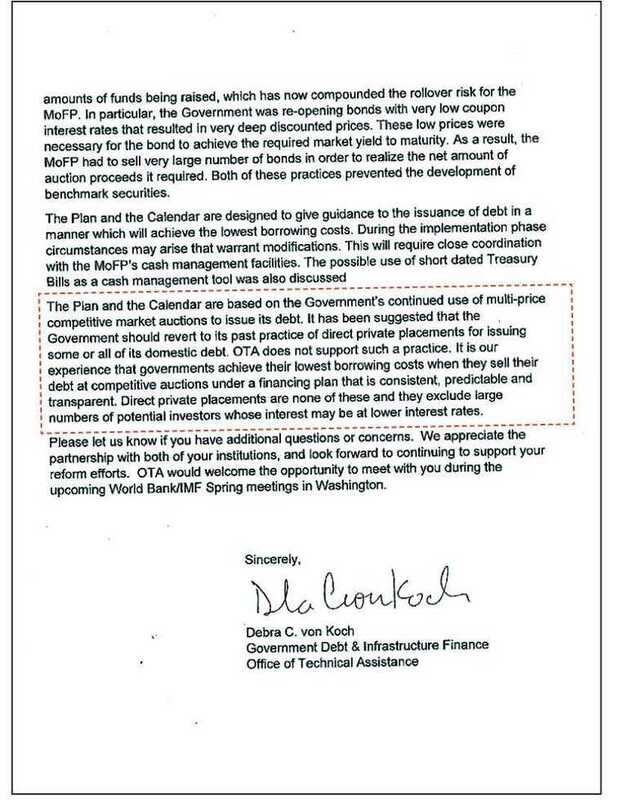 The World Bank paper, titled ‘Topics on Government Debt Auction Design,’ says: “The auctions are the predominant issuance mechanism for the sale of government securities. While a variety of issuance mechanisms are broadly adopted, auctions are by far the most common method of placements.” Wijewardena appearing as a good governance activist purposefully misled the whole country with wrong information to cover his past misdeeds. Please refer the scanned copy of ‘Topics on Government Debt Auction Design’ by the World Bank reproduced on this page. b. By letter dated 7 May 2017, the Department of the Treasury, United States of America, informed the Finance Ministry and the Central Bank that they do not support private placements. The letter stated that “it has been suggested that the Government should revert to its past practice of direct placements for issuing some or all of its domestic debt. We don’t support such a practice. It is our experience that that governments achieve their lowest borrowing cost when they sell their debt at competitive auctions.” Please refer scanned copy of the relevant section of the letter. Readers may understand why Wijewardena wants to close the matter so quickly without properly answering very valid questions raised in my previous writing. He carried out unsubstantiated and baseless attack on me and my policies over the years through his column in this paper. My effort is to expose the ulterior motive behind his unfounded criticism. 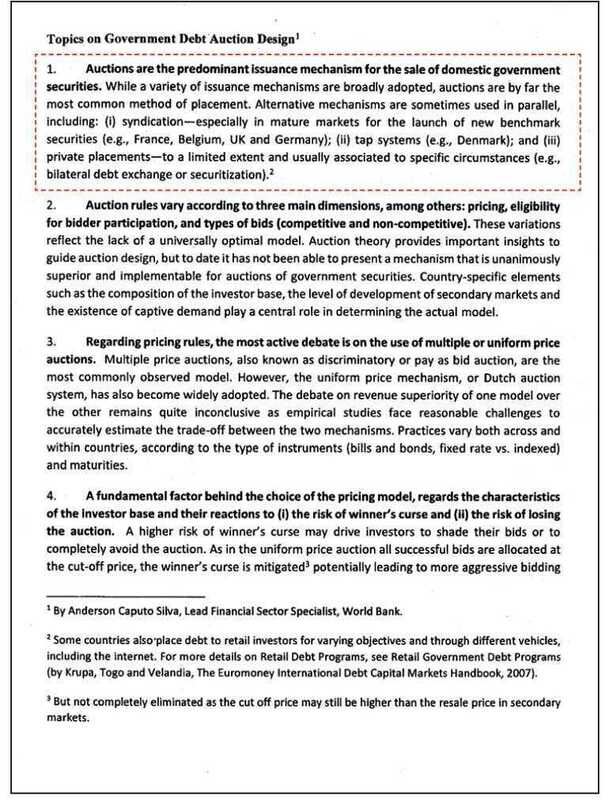 Though the whole world accepts the auction system is by far the best among all options in issuing government securities, Wijewardena created a public opinion demonising the public auction. He misled all investigative agencies appearing as a good governance activist and advising them on a matter he was previously involved. If the tender process is good for purchasing assets or services, why isn’t it good for T-bonds? If the auction system is good for issuing ISB, SLDB, SB, why is the same option not good for T-bonds? Wijewardena has no counter arguments when he is exposed in daylight. He is trying to deceive readers through reference to a recently-retired Deputy Governor on the content of my article. While there are many recently-retired Deputy Governors, I am not aware of the person he has particularly referred to. While holding the office of Finance Minister, I received sense of the remuneration packages of the senior employees of the Central Bank. However, many local and foreign industry practitioners and subject matter experts shared their experience with me, enriching the knowledge in technical subjects. Later changed to say late KNC introduced, but no evidence produced. He admitted the correct terminology ‘private placements’ according to the Monetary Board paper presented in 2008. Though he was DG for nearly a decade, he never introduced proper internal controls when carrying out unauthorised PPs. He advised both COPE and the Auditor General on a subject matter in which he was an accused. Private placements had caused colossal losses to the Government and economy. Numbers could be estimated directly as well as through a forensic audit. Wijewardena demonised the worldwide accepted auction system to defend his misdeeds in introducing corrupt private placements. But the evidence from the World Bank reports and the US Treasury proves that he is deliberately lying. Forensic audit will reveal the real culprits behind the scene, however only if the selection of the firm is conducted without the involvement of Wijewardena and his colleagues who are accused of negligence and breach of duties by the Bond Commission. Forensic audit should be conducted to cover the period 2008-2014. This will establish the massive losses from PPs in the past as quoted by the President (Rs. 1,000 b). Wijewardena engaged in a one-sided personal attack on me without producing any evidence. When his misdeeds are exposed, he should answer without hiding. I repeat that he cannot suppress the truth. It will come to the surface one day. It is happening now.